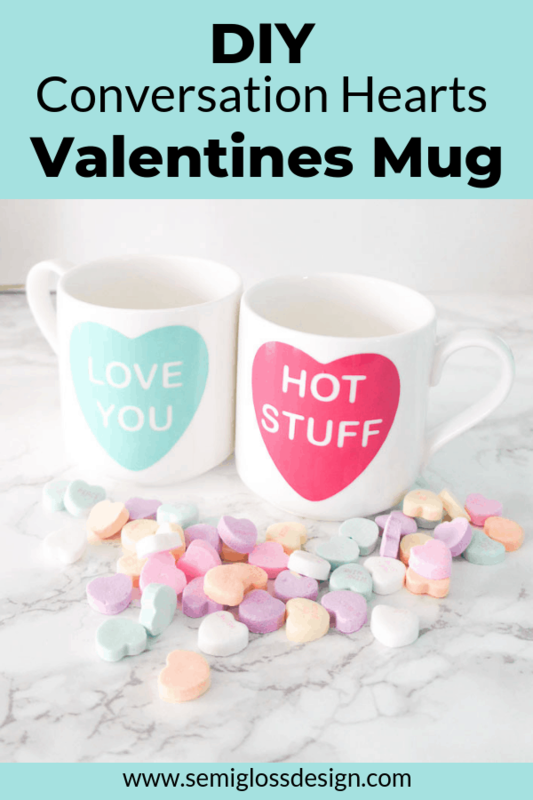 Home » DIY » Decor » Make Your Own DIY Valentines Mug with Vinyl! 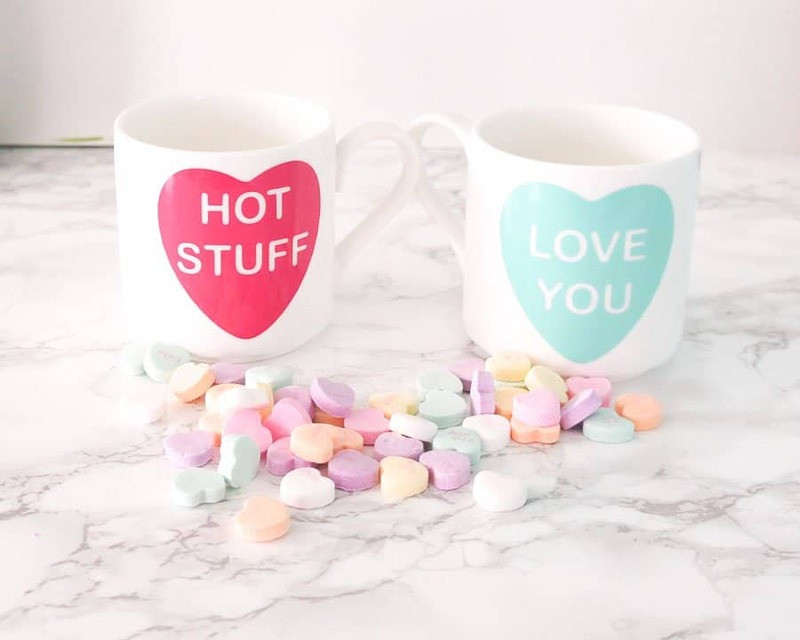 Surprise your sweetie with a DIY Valentines mug! This project uses permanent vinyl, but you can also learn how I used HTV on wineglasses here. My daughter just told me that she used to love Valentines Day, but now she hates it. Her school stopped celebrating the holiday and I think it’s a shame. What’s better than a sugar coma? I remember eating so much candy that I once vomited on the bus after a party. I also remember how much some of the conservation hearts made me cringe with embarrassment. As an adult, those are now my favorite. 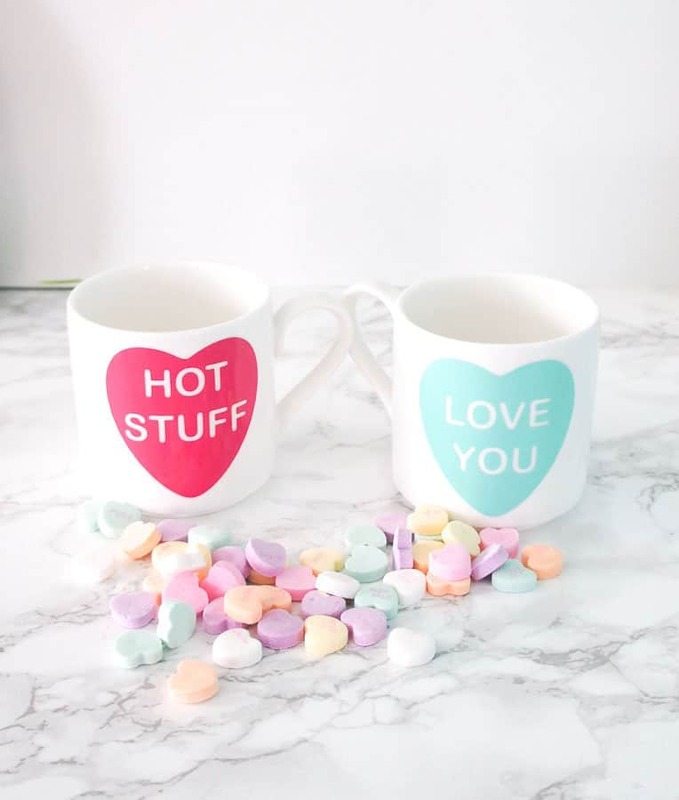 So, I made DIY Valentines mugs for my sweetie to celebrate the upcoming holiday. Keep reading to learn how, plus get your free cut files! If you want to add your own text, ungroup the image, delete the text included. Click the text button to add your own. I used Arial Rounded for a cute, retro feel. Open the cut file in Silhouette Studio. Choose the files you want and copy and paste them onto a new sheet. Size them appropriately. As is, they are sized to roughly 2.5″ square to fit my mugs. To minimize confusion, I changed the colors on each heart so that I would know which vinyl to use. When you’re happy with the size and placement, click on the SEND panel at the top of the screen. Your settings for vinyl will be 2, 8 speed, 9 thickness instead of a preset. Apply a 3″ square piece of vinyl to your mat, placed in a spot where it lines up with your design placement on the screen. When you’re ready for it to cut, press the send tab and press START. When the vinyl is finished being cut, unload the vinyl. Weed the excess away, leaving the heart with the cut out letters. 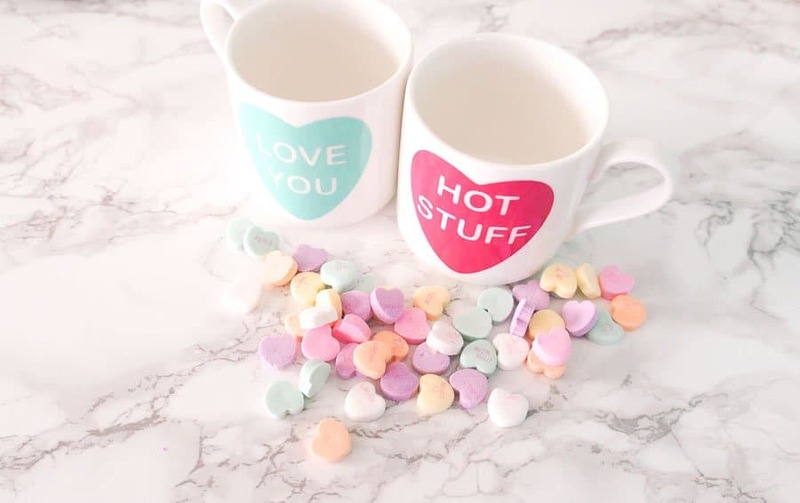 Use rubbing alcohol to wipe your mugs down. This removes any oil from your hands that keeps the vinyl from properly adhering. 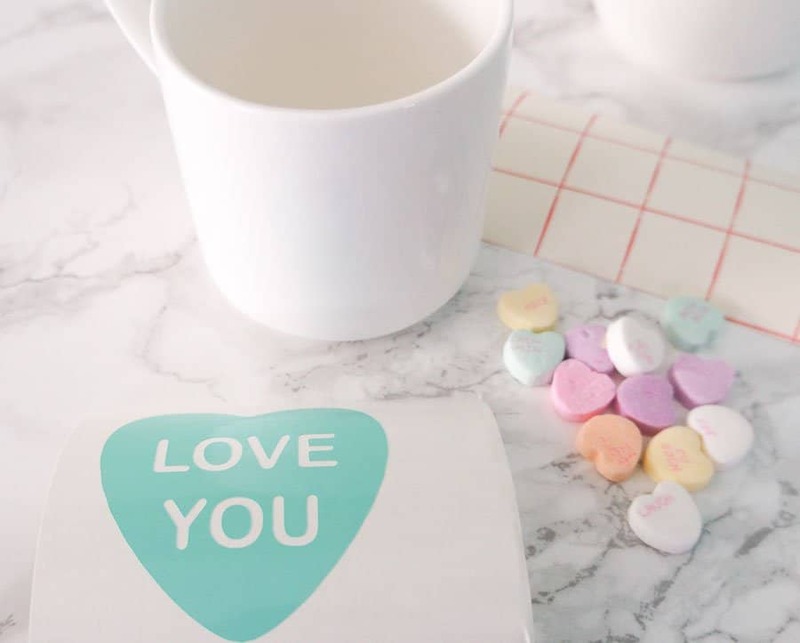 Apply a piece of transfer paper to the vinyl. 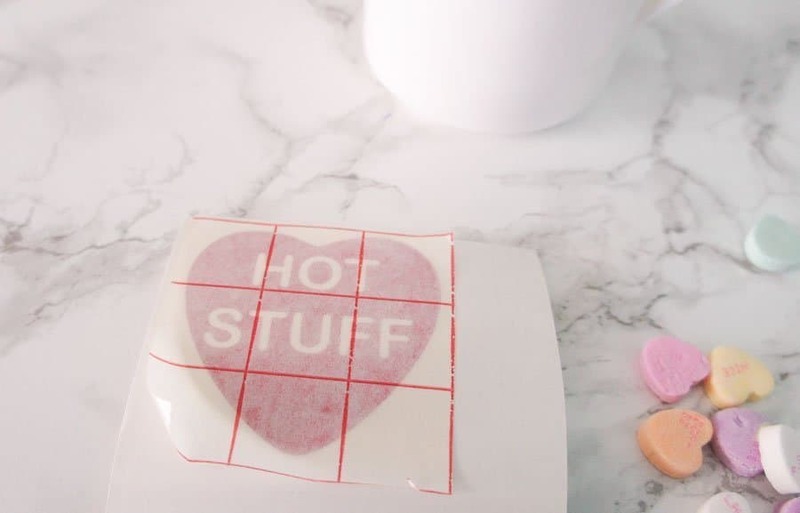 Rub it so that the vinyl sticks to the transfer paper. Peel the backing from the vinyl, leaving the design on the transfer tape. 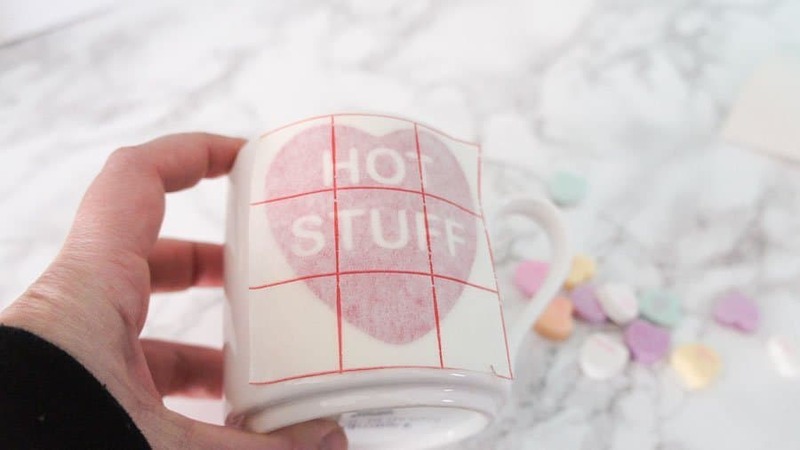 Place the design onto your mug along the center first. Press it down, working your way out from the center until the vinyl is firmly secured to the mug. Finally, remove the transfer tape. If you have any small wrinkles, you can normally smooth them out with your fingers. 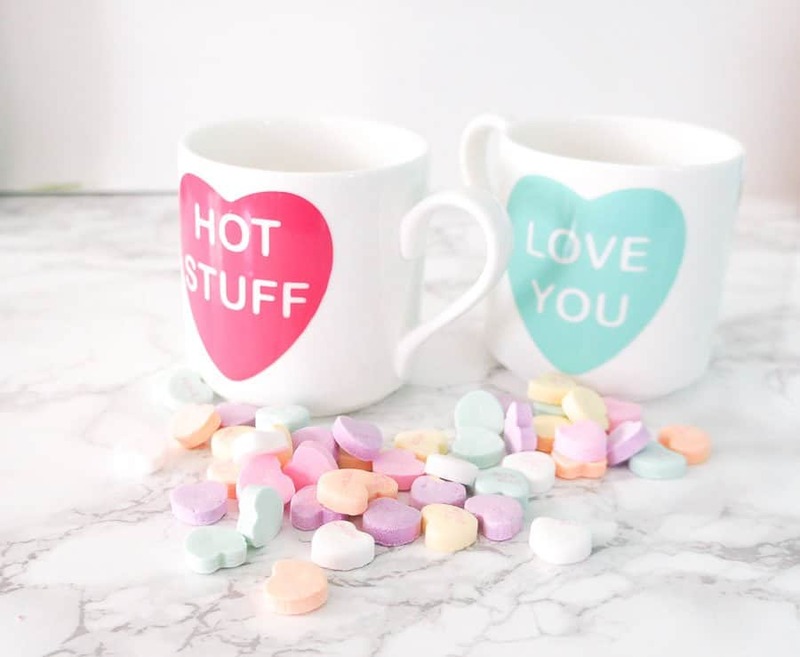 For best results, let your mugs sit for a day or 2 before use. This allows the vinyl plenty of time to adhere to the mug. Even permanent vinyl needs special care.